On the Monday I called the town planner, Mr A.J. Burger, to set up a meeting for the scrutiny of our plans. I had an appointment for two days later. Bright and early on Wednesday morning we drove through to the Swartland Municipality‘s offices located in Malmesbury (Western Cape, South Africa). The town planner’s office is situated in the heart of the municipality building. This is a neat and well-maintained older building with high ceilings and the same variety of wooden staircase you find across many of South Africa’s government buildings and museums. I must mention that all the staff were friendly and smiling. We were ushered into a well-lit room with beautiful views over the town and got straight down to business. Mr Burger and other town-planners must have an interesting job overseeing the growth of his jurisdiction. It must also have its difficult points, such as telling people like ourselves what’s wrong with their plans. Each municipality also has slightly different requirements in regards to plans. This makes it difficult in turn for architects and draftsmen to release plans that are 100% correct on the first go – hence “The Scrutiny”. Mr Burger was kind enough to take his time looking over the plans and letting us know exactly what additional requirements they have. He even drew us little sketches to explain certain South African building laws to us. The municipality have also asked us for a motivational letter explaining the more unusual aspects of our design. We left the offices confident that after a few minor adjustments to the plans we will be able to submit in full. 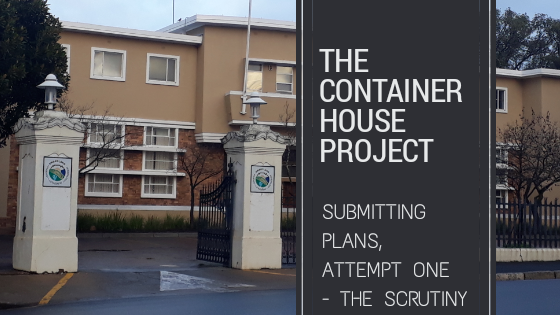 We expect to have the updated plans back from our Architect, Aubrey Philander, very soon, after which we will try again. We will see you again soon, Swartland Municipality! Are You Going to be Submitting Plans? If you wish to submit plans to your local municipality, we strongly suggest that you have a meeting with your local authorities before having any plans drawn up. A few months ago Kevin had a long chat with various people at the municipality. As a result of this, our plans only have a few minor modifications to be made. Our well-intentioned neighbours gave us some out-dated information. If we had relied on it we would have had much bigger problems to contend with. And not getting that advice might cost you more in the end.